Theologian Andrew Purves seemed to startle his audience at Samford University Thursday, March 6, by announcing that he was not interested in God, but he immediately quantified what he meant. "I am not interested in God as a concept, an idea or arguments, but as a living, reigning, active being involved in my life," Dr. Purves said. "I am not even interested in a divinity school God," he added. "God is God, not an argument or supposition. There is no way to get my mind around God." 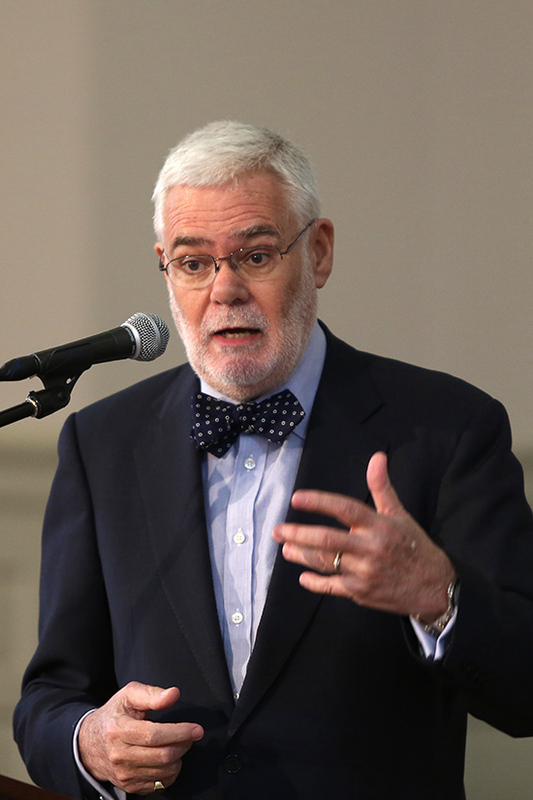 Purves, professor of reformed theology at Pittsburgh Theological Seminary, delivered the annual Ray Frank Robbins Lecture sponsored by Samford's department of religion. He suggested a couple of ways to think about God. First, he said, all talk is inadequate. "No words capture God, and the only way to know God is that God has come to me." The Presbyterian minister maintains that God chose Jesus to come among us that we might know him (God). "It is not enough to know who God is," said Purves. "God came among us through Jesus Christ as a pastoral God to embrace us, love us, and to bring us into communion with Him." Purves noted also that in Jesus, God doesn't come to us to say 'gotcha,' but that you have been loved from the foundation of the world. "No matter where you are, God has reached out in Christ to get hold of you." The imagery of a pastoring God, Purves suggested, is seen clearly in God who draws near, chases us, and who will not leave us alone. "'Grow up and get wise,' God says. 'I want you to be my person, especially when you are lost, afraid or in danger.'" Purves said the gospels describe God as one who seeks and saves us and has given all authority to Jesus Christ. No power, no regime, no economic border, claim, no condition--be it cancer, betrayal, divorces whatever--can trump Jesus Christ, said Purves. "Jesus Christ is Lord," he emphasized. "We must hear and obey." "Jesus is not a way, He is the ONLY way," Purves stressed, adding that "through Jesus bodily resurrection all power was given Him. He shattered the power of sin and death." The Robbins Lectures, established in 2008 to honor the memory of former Samford religion professor Ray Frank Robbins, focus on the intersection of scholarship and Christian living. Purves, Robbins and Kenneth Roxburgh, chair of the Samford religion department, all earned Ph.D. degrees from the University of Edinburgh.